President Donald Trump and congressional Republicans have repeatedly attempted to undermine the U.S. health care system, including with provisions in their unpopular tax bill that undercut the Affordable Care Act’s (ACA) individual mandate and drove up premium prices. Recent reports indicate that congressional Republicans will almost surely repeat their campaign to repeal the ACA and slash the Medicaid program. If they succeed, there could be dire consequences not only for Americans’ health but for state budgets as well. Federal Medicaid payments comprise an average of 17.7 percent of states’ total expenditures, which means that deep cuts to the federal government’s Medicaid payments would squeeze other essential services in the state budget such as education. A new Center for American Progress analysis shows that if states were to absorb Medicaid funding cuts—such as those Republican lawmakers have previously proposed—by slashing their education budgets, public K-12 school teachers and college students would be hit hard. (see Methodology) Education accounts for more than a quarter of all state spending, leaving it a prime target for cuts if President Trump and Congress cut Medicaid. 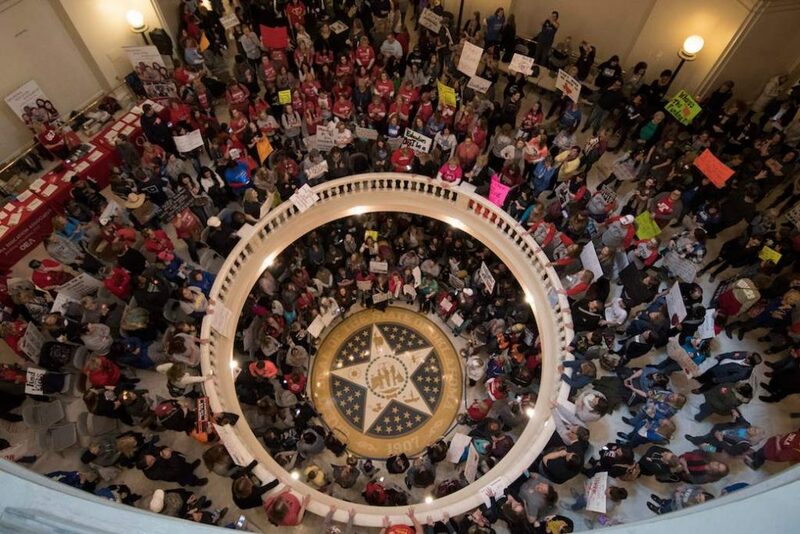 Despite the proven association between higher teacher pay and increases in students’ high school completion rates and future job salaries, most teachers are chronically underpaid—as recent protests in West Virginia, Oklahoma, and beyond have highlighted. Meanwhile, today’s college students face sky-high tuition and extreme debt, putting economic security out of reach for too many young people. If states fill the funding gap that would be left by Medicaid cuts by slashing teacher pay, K-12 teachers would have to take an average annual pay cut of nearly $4,300 in 2027. Alternatively, if states instead increase tuition at public colleges and universities to offset the Medicaid cuts, the average public college student would face an annual tuition hike of more than $905 in 2027. 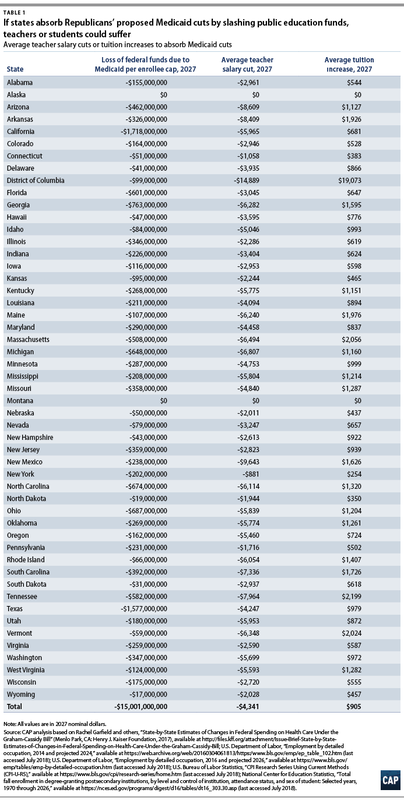 Table 1 provides a state-by-state breakdown of these potential cuts. Medicaid provides health insurance to more than 73.6 million people—nearly 1 in 4 Americans—most of whom are children, older adults, and people with disabilities. Under the Trump administration, the program has faced relentless attacks. In his 2019 budget, for example, President Trump proposed slashing the program by $306 billion over the course of a decade, while the Senate’s most recent so-called repeal-and-replace bill attempted to cut federal Medicaid funds for states by $160 billion over six years. Such cuts are deeply unpopular: 80 percent of voters overall oppose cuts to Medicaid, and more than half of voters—56 percent—are strongly against cuts. Federal funding for states’ Medicaid programs accounted for a sizable share of states’ total expenditures—nearly 1 in every 5 dollars—in fiscal year 2016. If federal policymakers successfully push deep cuts to Medicaid—prompting some or all of these federal dollars to be lost—state policymakers will face painful choices. The decision to either continue administering Medicaid and protect residents’ health or to maintain critical services such as education and transportation is a seemingly impossible deliberation. These tough choices will push states—many of which are already cash-strapped—to draw from other sources if they decide to continue funding Medicaid benefits. Historically, many states have resorted to cutting funding for public education in order to plug budget holes. Previous CAP analysis found that, in response to the Great Recession, “29 of 50 [state] governments lowered their total level of direct support to public [educational] institutions between fiscal years 2008 and 2012.” Notably, states received a temporary increase in the Federal Medical Assistance Percentage (FMAP) between October 2008 and December 2010, which was crucial in supporting state Medicaid programs. Without FMAP increases—which are not currently being proposed—the cuts to education likely would have been even deeper. Table 1 shows how teachers and students in states’ public education institutions could be harmed if they bear the brunt of cuts to Medicaid. In the face of congressional Republicans’ and President Trump’s determination to overturn the ACA and slash Medicaid funding, the stakes couldn’t be higher: Not only is Americans’ health care on the line, but state-level policymakers may be confronted with a terrible choice between providing health care for people with disabilities, seniors, and low-income children and families on the one hand, and funding other key state priorities such as education on the other. President Trump and Congress should be investing in health care, education, and other services on which Americans rely to live healthy, fulfilling lives—instead of pushing cuts to critical programs such as Medicaid. Heidi Schultheis is a policy analyst for the Poverty to Prosperity Program at the Center for American Progress. Eliza Schultz is a former research associate for the Poverty to Prosperity Program at the Center. Rachel West is the director of poverty research for the Poverty to Prosperity Program at the Center. The authors are deeply grateful to CJ Libassi, Erin Roth, Samantha Batel, Maura Calsyn, Thomas Huelskoetter, and Katherine Gallagher Robbins for their expert advice and analysis. The president’s 2019 budget proposed cutting $306 billion from Medicaid by the year 2027, modeled after cuts proposed in the legislation that Sens. Lindsey Graham (R-SC) and Bill Cassidy (R-LA) introduced in September 2017, which would have converted federal funding for the traditional Medicaid program from an open-ended model to a per capita allotment. The authors rely on Henry J. Kaiser Family Foundation (KFF) analysis of the Graham-Cassidy bill for the amount of Medicaid funding that each state would cut. This analysis models the effects if states, when faced with reduced funding for traditional Medicaid, choose to continue to fund their Medicaid programs at existing levels by making cuts to another major state expenditure: public college and university or K-12 education—both of which states have cut during past funding shortfalls such as the Great Recession. First, it presents the average amount that public K-12 school teacher salaries would decrease were funding cuts applied solely to teacher salaries. Second, it presents the average amount that higher education tuition and fees would increase for students were funding cuts absorbed entirely by students at two- and four-year public colleges and universities. To estimate how much public school teacher salaries would be affected if states choose to offset Medicaid cuts by reducing teacher salaries, the authors used employment projections data for teachers between 2014 and 2026 from the U.S. Bureau of Labor Statistics (BLS) project the size of the teacher population in 2027, assuming an equal rate of growth in every state. The authors divided each state’s estimated Medicaid cut by that state’s total projected 2026-2027 school year teacher population to determine the average teacher salary cut in 2027. All monetary values are expressed in nominal 2027 dollars, consistent with KFF estimates. To estimate how much higher education tuition and fees would increase if Medicaid cuts were absorbed entirely by students at two- and four-year public colleges and universities, the authors obtained enrollment projections for students of two- and four-year public institutions in each state from 2016 to 2026 from the National Center for Education Statistics and used the national average annual growth rate to project the size of the 2026-2027 enrolled student population in each state. The authors divided each state’s estimated Medicaid cut by that state’s total projected student enrollment to determine what the average increase in each student’s tuition and fees would be in the 2026-2027 school year.